A 24-hour general strike was called, as a unified action by all the trade union centres of the country, against the pension and labour reforms of the illegitimate government of President Michel Temer [Temer took office on 31 August 2016, after the impeachment and removal of his predecesor, Dilma Rousseff, having served as Vice President since 2011 and as Acting President since 12 May 2016]. This strike was a massive, unified mobilisation of the organised working class – the largest movement in recent decades. Millions of workers from, transport, industry, finance, post, education and public services stopped work. Workers organised in the social movements, in particular the movement of the homeless, MTST. They took to the streets during the night, blocking dozens of motorways and main roads in the largest cities. In the commercial centres it was like a public holiday, with little activity. Millions of workers left their workplaces. The trade union confederations estimated that between 35 and 40 million workers were on strike on 28 April. Even if the strike was not as big as this, it was a powerful movement that made clear the potential power of the working class in the struggle against Temer’s attacks. One of the most important aspects of this mobilisation was the paralysing of the workplaces, and the demonstrations, involving hundreds of thousands. The local and federal governments tried to create a climate of intimidation. In the media they threatened police repression against demonstrators. Due to a total stoppage of trains, busses and the metro in Sao Paulo, the council announced that the local government would pay the passage for those council workers who wanted to work using Uber taxis. This strategy totally back-fired and the governor had to withdraw the offer. In Rio de Janeiro, a convoy of riot police, with no pretext, indiscriminately attacked protestors during the evening of the 28th. In Goiania, one demonstrator remains in a critical condition, between life and death, after being beaten on the head by riot police. In Sao Paulo, a local march, destined to arrive at the house of the illegitimate President Temer, was brutally repressed and prevented from reaching its destination. Numerous activists were arrested by the police and then later released. Despite this, the demonstrations were very combative and surpassed in some cities the scale reached in previous days of protest and struggle. This resulted in the government provoking violent clashes to justify its arguments condemning the movement, even though the immense majority of the population is opposed to the government’s ‘reforms’. Despite a bombardment of propaganda in the media supporting the government policies, recent opinion polls show 71% of the population opposed to the pension reform and 64% against the labour reforms, which will strengthen the employers against workers’. Temer has one of the lowest approval ratings for a president in Brazilian history, at approximately 9%! The seriousness of the government’s policy attacks resulted in important support throughout society for the strike movement. This was even reflected in institutions such as the National Confederation of Brazilian Bishops (of the Roman Catholic Church), which criticised the reforms and supported the strike movement. Temer reacted to the general strike by urging his ministers to declare the movement had been a failure. This was repeated by a section of the media. Yet the strategists in government know that the general strike consolidated an unfavourable situation for Temer in the National Congress. Temer does not have a two-thirds majority in the chamber of Deputies or the Senate, which is needed to approve the constitutional reform to pensions. The former President of the Senate, who backed the pro-coup manoeuvres which led to the impeachment of Dilma Rousseff of the PT (Workers’ Party), has declared his opposition to the reforms! Following these set-backs, the government is attempting to accelerate the vote on the labour ‘reforms’, which require only a simple majority to become law. In the case of the pension attacks, they are losing the votes needed and realise that they may have no option but to open the way to withdraw it completely. If they do this, the government will have lost its reason to exist. It was installed by the big Brazilian capitalists, which hoped it would be able to carry through the most brutal anti-working class programme since the 1990s. Without the pension reform, Temer could easily fall. Various mechanisms exist to allow this, including investigations into illegal financial corruption charges against Temer during his Vice-Presidential election campaign (which he fought together with Dilma Rousseff). In the event of Temer falling from power, 85% of the population support direct elections as opposed to indirect elections for a new President by the congress, with is laid down in the constitution as an option. Despite the massive force demonstrated in the general strike on April 28th the battle is not yet won. It is urgent to develop, even further, the mass struggle to defeat this government and its reforms. 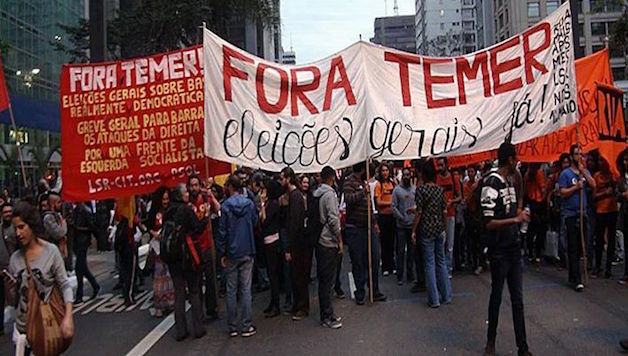 The Brazilian trade union movement has been weakened following the neo-liberal attacks of the 1990s and its incorporation into the PT governments. In recent years there have been many strikes for immediate economic demands but weak unified struggle of a more general character. The general strike of April 28th opened a new stage for the trade union movement. The unified character of the struggle was very important. Despite the limits shown by the trade union bureaucracy in the leadership of the major trade union centres, there was massive pressure from below, as the gravity of the attacks by the government was well understood. From below, local organising committees for the general strike emerged, such as committees against the reforms. Now it is urgent to strengthen these committees and organise them in a more generalised way, as a means of ensuring the rank and file base has a guaranteed role in determining how the struggle now needs to be developed. The LSR (CWI in Brazil), on the 28th April, demanded that a new general strike of 48 hours be called now and be organised from below. The leadership of the main trade union centres should have announced a call for such a strike on April 28th but they failed to do so. It is necessary for all sections of workers to call mass assemblies in the workplaces, to debate and discuss the way forward and to organise for a new 48 hour general strike. The decisions about which way forward for the struggle need to be taken democratically, with the participation of all sections of the population involved in struggle. To organise such a process of mobilisation it is essential that a National Assembly of all workers in struggle is convened, to build a political and organisational basis for the re-organisation of the workers’ movement for the new stage of struggle which has now begun. In this process the socialist left can build a political alternative that offers a way out of the crisis from the point of view of the working class. It can offer an alternative to the neo-liberal attacks which are being implemented and also an alternative to the class conciliation which was defeated and exposed when the PT was in government. The strength of the movement reflected in the general strike has not prevented a brutal reaction from the state, the employers and the right-wing. The strike demonstrated the potential for action by a combative working class. It polarised the situation in the country and drove the enemy class to respond in an even tougher manner. The biggest expression of this process was the arrest of three members of the MTST on 28th April, during a protest on the main road in the east zone of Sao Paulo. Many members of the LSR were participating in this same action and witnessed the brutal action by the police. Six people were arrested; all black, poor and living on the periphery of the city and who are activists in the MTST, the homeless movement. The freeing of all those arrested must be inscribed on the banner of the Brazilian workers’ movement and internationally. We also demand the release of Rafael Braga, the only prisoner remaining in jail arising from the mass mobilisations which brought millions onto the streets in June 2013. Rafael is a black youth from Rio de Janeiro, who was imprisoned for carrying a bottle of disinfectant in his bag, which was taken as to be a potential explosive device. After this he was falsely accused of drug trafficking and sentenced to 11 years in prison in a totally arbitrary manner.